You may have noticed that one of my menu-planning tactics is to just pick up one cookbook, and make a whole bunch of dinners from that book for 3-4 days. It helps give me a little focus. Recently I ordered "30-Minute Vegan: Taste of the East," since I liked their "Taste of Europe" edition so much. I've only made a few things, but so far Taste of the East has been quite a hit! The book suggested serving these two dishes together, and it was a good idea! 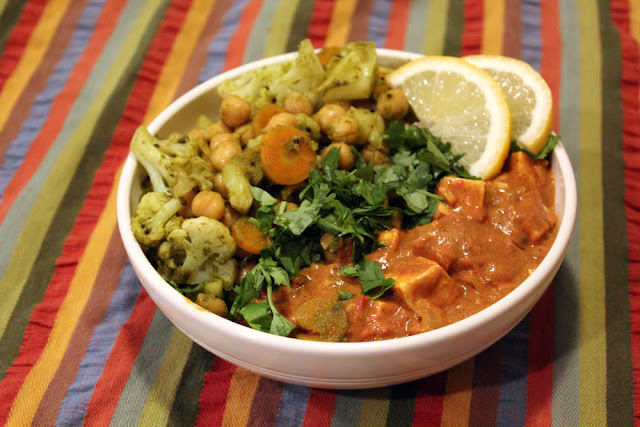 They really balanced each other : the chickpea-cauliflower dish was light and fresh and full of herby green flavors, while the Shahi Paneer was rich, creamy, and robust. I loved them together, but I especially loved the spicy tomato dish. The tofu paneers were lightly marinated and then baked before being included in the stew, and they turned out great. Also, I used unsweetened soy yogurt in place of cashews to cut down on the calories, and the meal was just great. I'll definitely make these dishes again. Here's an up-close pic of the tofus, cut up for the spring rolls. This was probably my least favorite of the recipes I've tried so far. The tofus themselves are pretty good, but nothing too dynamite. 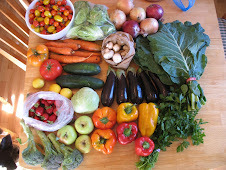 Here's my table laid out with all the fixin's! 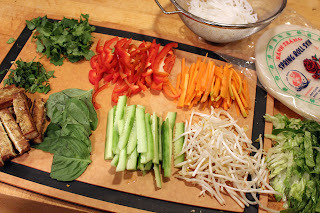 I was happy to finally use some of my rice paper rolls and rice noodles. They have been in my pantry for far too long. Honestly, apparently I sorta stink at rolling up spring rolls. Mine were all loose and weird and hard to eat. How do people make them so snug and tight? The flavor was pretty good, but not really worth all the work. I did like the tart-spicy Nuoc Cham dipping sauce though... and it was super easy. The most fun part of this dinner was that Mr VE&T and I each rolled our own Spring Rolls. Mr VE&T harkened back to his college days and his rolls all looked like joints, which was sorta funny. I never explored that scene, so mine looked like little burritos (because, I have explored the burrito scene). This dinner was a bonafide homerun. 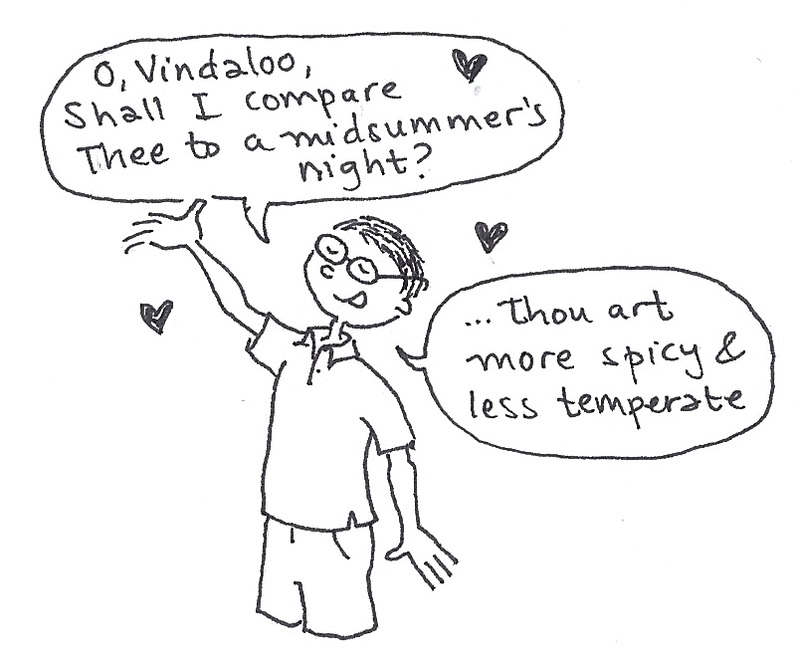 Mr. VE&T pretty much fell in love with the Tofu Vindaloo. It was a super umami blast of rich, intense flavors. 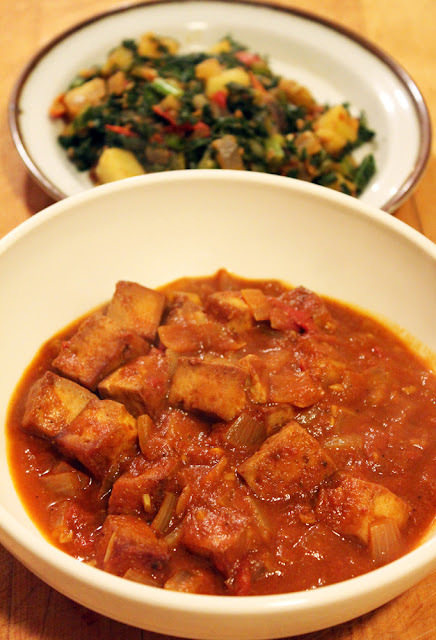 I used the Tempeh Vindaloo recipe, but used tofu instead and roasted the tofus for a longer time, so they were more firm, the way we like them. Ever since then, he has been asking for Tofu Vindaloo again! Haha, I had a laugh at Mr's looking like joint and yours looking like burritos! 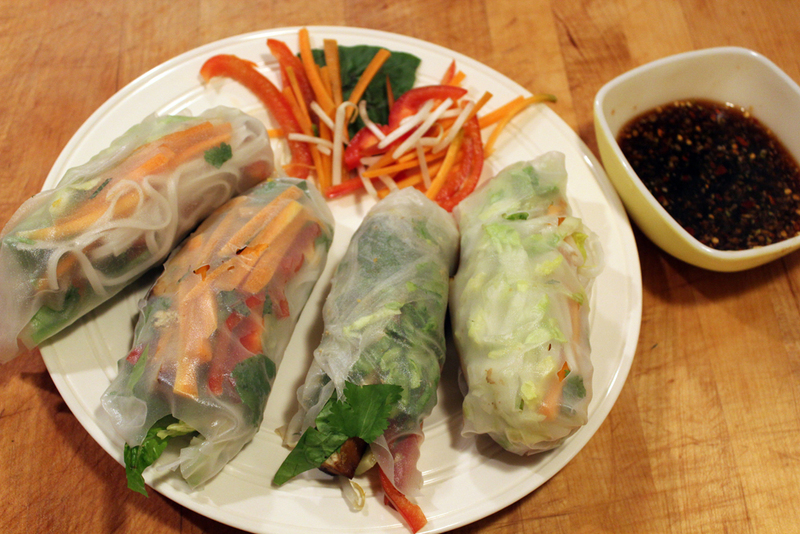 I am making the bf some rice paper rollies tonight, they're always fun and filling! Have not heard of this cookbook but I am going to look it up! It looks like a great book going by what you've made. Your rolls look perfect to me, I always mangle them..
And I have never had vindaloo but it always makes me think of this football song us English had I think back for the football world cup? Haha, I love the illustrations of Mr VE&T! 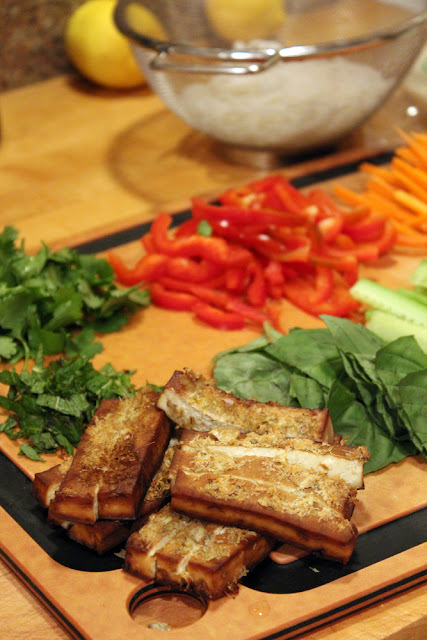 I'm really craving tofu after reading this and you've reminded me that I have some rice noodles and rice paper rolls just sitting in my kitchen cupboard waiting for me to do something with them! i love eastern flavors, these all look so good! 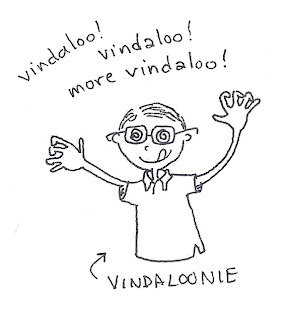 I have intended to try making vindaloo for some time, but just never have - this reminds me to do so! That sauce on the paneer looks phenomenal - was it a hard one to make? If not, it's a total winner. Even if it is, still a winner I reckon! I like your dinner planning strategy! I should probably start doing the same, so I finally use my cookbooks. 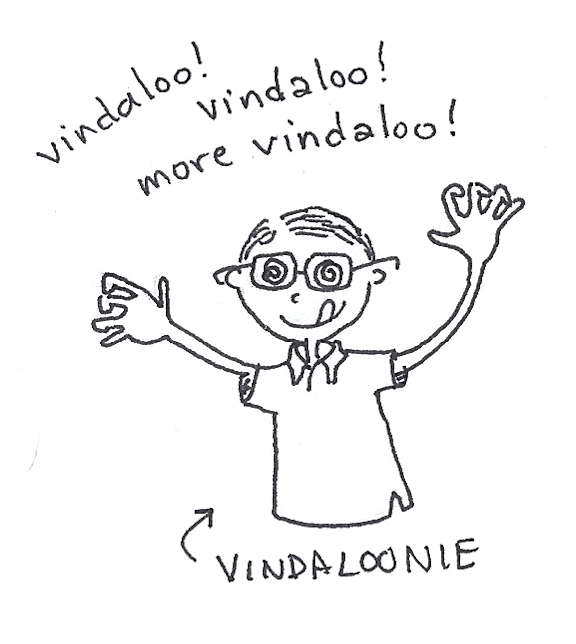 I live vindaloo, the recipe looks great! I haven't heard of this series of books, but will have to look them up. I love making rice paper rolls, they are so cute, but I always have a few that end up looking a bit baggy. Your posts are always so much fun. I feel like such a blogging and cooking slacker. I LOVE that cookbook and the tofu in tomato cream sauce is my absolute favorite recipe from it! Thanks for reminding me that I need to revisit it. I've dabbled a little in this book and I love the Tamarind Sauce (p. 13)! It's way better than the corn syrupy kind you find at restaurants. And though very simple, I love the cucumber salad with peanuts and chile in the summer. I could eat it every day! 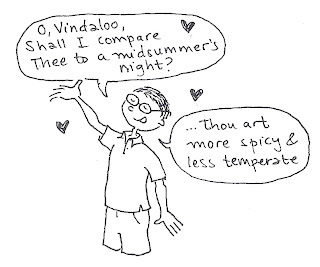 I'll be trying that vindaloo though - I don't think I've ever had it before! And I know you don't like sushi, but the edamame dip is really good in nori rolls.